Lake of Bays Custom Homes was established in 2009 by Tim Lamb. We have partnered with them on the Lake of Bays Haven and Hidden Ridge Alpine Home projects in Ontario. The Lake of Bays Haven home has also been featured in Timber Home Livings Welcome Home Series. and Hideaways Magazine. They are based out of Port Sydney in Muskoka and service from Gravenhurst to Burks Falls and Dorset to Lake Muskoka in Ontario. They provide complete project management and quality turnkey custom homes and cottages, striving to offer the best to their customers, something you will quickly realize when you choose to work with them. Canadian Timberframes is fortunate to have industry partners like Lake of Bays Custom Homes with the knowledge, skills and integrity to create stunning timber frame homes. Without builders like them we wouldn’t have the quality homes and projects like we do in Ontario and across North America. We look forward to the next Muskoka project that our teams can work together on. Guarino Construction is a family operated business which was founded in 2003 by AJ & Paulette Guarino. 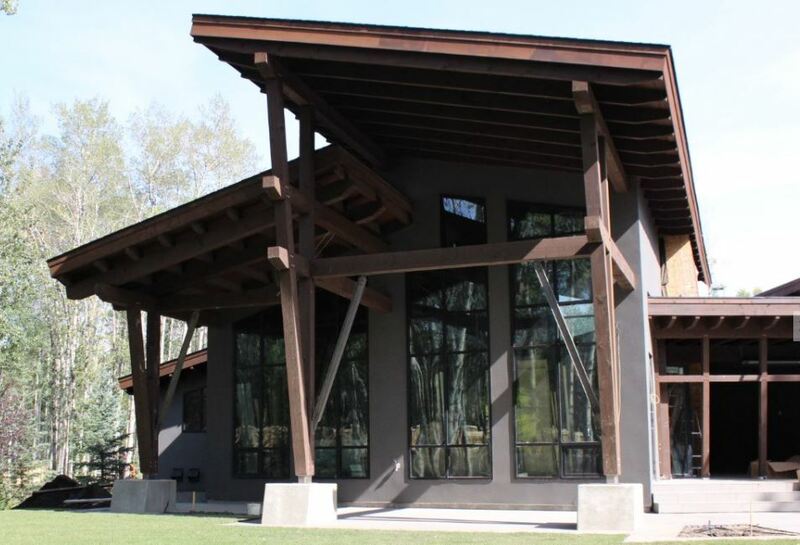 Our most recent project with them was the Colorado Springs Timber Frame Home which was completed in July 2018. Canadian Timberframes is proud to have industry partners with the integrity and knowledge of Guarino Construction, without them we would not be able to deliver such a comprehensive product that results in beautiful timber frame homes leaving our clients in Colorado extremely pleased that they spoke to Guarino Construction and Canadian Timberframes. We can’t to start on our next home with them in the United States. Catch up with CTF at the 2019 Calgary Home + Garden Show. Canadian Timberframes offers decades of experience working with clients throughout North America and we would love to meet up with you between February 28 - March 3 at the BMO Centre & Corral in Stampede Park. 1. We have built a solid reputation as one of the world's premiere timber frame companies not only because of our quality, precision, and passion but because we truly care about our client’s needs. 2. Our Custom wall & roof systems + additional components offer exceptional value during the installation process and provides an efficient & cost effective solution. Offering cost savings to home owners & time savings to builders in various ways. Canadian Timberframes has built a reputation as the premier design, manufacturer and installer in the timber frame industry by supplying quality product to clients, builders and architects across North America. We are passionate about our work. The Canadian Timberframes philosopy has always been to provide our clients with personal timely service, attention to detail, outstanding quality and exceptional value. Check out range of projects in Alberta. There are 3 great reasons to drop by the CTF booth in Marlborough from October 26 - 28. 2. Our Custom wall & roof systems + additional components offer exceptional value during the installation process and provide an efficient & cost effective solution. Offering cost savings to home owners & time savings to builders in various ways. 3. You save buying Canadian - as your $USD goes further with the exchange rate and you are not tariffed on pre-manufactured components that ship from Canada to U.S.
Canadian Timberframes offers decades of experience working with clients throughout North America and we would love to meet up with you from October 26 - 28 during the Log & Timber Home Show in Marlborough, MA. Here are all the details of the Log & Timber Home Show. We can offer you two complimentary tickets, if you are interested please contact us. We are passionate about our work. The Canadian Timberframes philosophy has always been to provide our clients with personal timely service, attention to detail, outstanding quality and exceptional value. Check out range of projects in the United States. Canadian Timberframes offers decades of experience working with clients throughout North America and we would love to meet up with you from September 28 - 30 during the Log & Timber Home Show in Denver, CO.
A team that works hard & plays hard together! What a weekend! We came 3rd in the Corporate category at the 2018 Golden Two Four . Our team of ten completed 21 laps in a time of 23 hours 26 minutes. It was great to be able to support a local event and our team put on a great performance to finish on the podium against quality teams from across BC and Alberta. The Golden Two-Four attracts over 500 riders to our great town to ride on some of the best trails in Western Canada. Each lap is approximately 14.5km with 500m of climbing and the event has different individual and team categories across the 8 and 24 hour races. Our team from left Pierre Couture, Jeff Bowes, Pierre Lussier, Cael Bowes, Marie Robert, David Gagne, Logan Winters, Joachim Strobel, Jeff Parker & Garrett Cox. Full Results from the weekend. Canadian Timberframes offers decades of experience working with clients throughout North America and we would love to meet up with you between March 22 - 25 at the International Centre. Drop by CTF at the Calgary Home & Garden Show. Canadian Timberframes offers decades of experience working with clients throughout North America and we would love to meet up with you between March 1 - 4 at the BMO Centre & Corral in Stampede Park. Drop by Canadian Timberframes booth #408 in Vancouver at the BC Home & Garden Show. Canadian Timberframes offers decades of experience working with clients throughout North America and we would love to meet up with you between February 21 - February 25 at BC Place in Vancouver. There are 3 great reasons to drop by Canadian Timberframes booth #208 in Nashville. Canadian Timberframes offers decades of experience working with clients throughout the United States and we would love to meet up with you between January 19 - January 21 in Nashville, TN. 3. You do not pay duty on shipping across the border – we are sending our complete packages all across the United States. Check out Olde Stone one of our Kentucky Homes. View our Eastern US projects and we invite you to contact us and give us the opportunity to personally discuss your timber frame project. President Jeff Bowes takes you through how we hand select our logs and make sure we don’t have logs with inconsistent timber fibre. Jeff and Rick selected over 190 logs during the visit. Once they are delivered we put them in racks to air dry for a year before we start using them on your projects. We are very fortunate to be able to hand select our logs which allows our clients to receive top quality timber that is suited to the needs of their projects. Kootenay Manufacturer of the Year! We are pleased to announce that we have been named Manufacturer of the year at the recent Kootenay Manufacturing Awards. In their 2nd year the awards recognise the growth, innovation and entrepreneurial spirit of the manufacturing sector. 150 businesses entered the awards which are run by Kootenay Business and we are very proud to have taken out the top award. Congratulations to all of the other winners across the 5 categories and also to those businesses that were nominated. All of the winners can be found on the Kootenay Business Website. An economic study produced by PwC for the B.C. forest industry confirms that the sector continues to be a cornerstone of the provincial economy and one of the largest employers across the province. 140 communities in B.C. rely on the forest industry and are considered forest dependent through mills, community forests, or significant logging operations. In 2016, the sector generated and supported more than 140,000 total jobs (59,900 direct and an additional 80,828 indirect and induced jobs) in the province. That amounts to forestry generating one out of every 17 jobs in the province and total labour income of $8.6 billion. B.C. has vast forest resources with roughly 60% of its land base (55 million hectares) being productive forest land, providing rich, diverse, and abundant wood fibre. These forests contain approximately 11 billion cubic meters of standing timber. B.C. is a world leader in sustainable forestry. The industry plants three trees for every tree harvested on average, and less than one percent of the timber land base is harvested each year. 259 million seedlings were planted in 2016 alone! B.C. forest industry generated $33 billion in output and $12.9 billion in GDP to the province. The United States was the top destination for B.C. forest exports in 2016, accounting for 53% of the industry’s exports. 11% of all rail traffic in Western Canada is forest products. For stepping up & embracing all the challenges that have been put on you the last 3 months. Having a favorable reception to a major shift in your work load & responsibilities; looking for ways to contribute more. For helping to improve the process & for your time spent to help make this workplace better! There are 3 great reasons to drop by Canadian Timberframes booth #303 in Asheville. Canadian Timberframes offers decades of experience working with clients throughout the United States and we would love to meet up with you between November 3, 2017 - November 5, 2017 in Asheville, NC. 2. Bottom line: CTF wall & roof systems + additional components offer exceptional value during the installation process and provides an efficient & cost effective solution. Offering cost savings to home owners & time savings to builders in various ways. There are 3 great reasons to drop by Canadian Timberframes booth #327 in Marlborough. Canadian Timberframes offers decades of experience working with clients throughout the United States and we would love to meet up with you between October 27, 2017 - October 29, 2017 in Marlborough, MA. 1. We have built a solid reputation as one of the world’s premiere timber frame companies not only because of our quality, precision, and passion but because we truly care about our client’s needs. Check out Meredith Bay one of our New Hampshire Homes under construction right now. We constantly refresh our inventory of logs that we keep on hand drying in our large log decks. This week we have over 20 loads of logs arriving! All the wood comes from within 2 hours of our operations. Rick is our man unloading the trucks and then he will put them in racks to air dry for a year before we start using the logs on your projects. How good is that view! Another reason to come and see us when you are in British Columbia. We love it in Golden, BC, A great place to live and the perfect location to source quality timber. Over the next couple of days, we have 20 loads of logs arriving! A few loads are dead standing wood from the West Columbia Valley. All the wood comes from within 2 hours of our operations. Every log is time stamped when it arrives, as we air dry our logs in decks for a year before using our inventory. Celebrating another 15 year Employee Anniversary! Today we are honoring Judy Wikman for her 15 years of Service! The second employee of our who has hit 15 years. June 19, 2002 - present. We are so grateful & appreciative of your loyal & dedicated contribution over the past 15 years Judy! We look forward to another 15 years! Judy was presented with her cheque and a plaque to go on our 'wall of fame' where we recognize the tenure and contribution of all of our employees who hit milestones. We also celebrated Joachim's 5 year Anniversary today as well! Thanks Joachim for all that you have brought to CTF; looking towards many more successful years with you! We had a great company BBQ to celebrate Judy & our last Quarters accomplishments! Always thinking about your work week ahead, planning, taking drawings home on the weekend to study on your own time, plus all the extra Sat’s your willing to pitch in and help the company get caught up. And lastly, always being very open to input! – Thank You for your contribution! Go and enjoy a nice dinner out or a weekend of fun from the CTF Management Team!! Canadian Timberframes is proud to be in our 12th consecutive year in supporting Kicking Horse Culture as a Platinum Sponsor! Kicking Horse Culture is a community arts council with a Mission to engage, energize, and enrich the cultural life of Kicking Horse Country through the delivery of a variety of programs and initiatives throughout the year. The arts are such a wonderful and essential part of our local community. Collectively, arts and culture are powerful drivers in the creative economy and an integral part of a healthy, flourishing community; like ours. Live Kicks (live entertainment from shows to concerts) provides a platform for memorable experiences like no other, and offers an avenue for Canadian Timberframes to give something back to the wider community, as well as our employees. We are totally committed to supporting the cultural life of Kicking Horse Country....for years to come! This was their first poster & event we sponsored through Kicking Horse Culture - the first year the program started. Always stepping up, filling in, helping other departments, moving summer vacation to back fill for another. Always there to offer her help, assistance & expertise with a smile & can do attitude! Thank-You Eleanor for all that you do to help keep this boat afloat! And for being such a wonderful example of our company values. You embody everyone of them! Another visit today from clients who wanted to take the opportunity to fly to the mountains in BC and tour our facility. The family flew in from Ontario & are spending the afternoon touring the mill, our manufacturing plant & spending time with our design team in our boardroom on their design. We are always happy & honored when clients make the trip to our home here in Golden! We often have clients fly in to do a tour of our facility & hit the slopes at the same time up at Kicking Horse Mountain Resort. We have clients visiting this week from Arizona who are starting to build in Montrose Colorado! They were outside, visiting the mill, their canted lumber that has been rough cut and were inside the HO with our designers working through their house design. We are always happy to host clients whom are interested in making the trek to Golden BC and to see where their dream home starts from logs, to canted lumber to CNC cut timbers through to finishing & packaging. Stay tuned as we post their project with updates. The Grizzly Paw Brewery was originally designed as a steel structure (Figure 4a). The cost of steel, the complexity of the serrated roof-line, and the parallelogram layout caused the preliminary cost estimate to exceed the budget. Canadian Timberframes was consulted and preliminary timber designs and cost estimates were developed. The cost for the timber building was significantly less than the steel quotes. It was concluded that a wood structure could meet the budget and all other performance requirements. In fact, the complicated roofline which had been problematic for steel fabricators was a natural fit for the timber supplier’s experience and computerized shaping equipment (Figure 4b). In addition, the timber structure better suits the Rocky Mountain architectural style typical of the area, and will be an appealing aesthetic feature during public tours. Here is the full case study produced by Canadian Wood Council, Wood Works and Canadian Timberframes. Keeping positive attitude, thinking ahead, working through the cold weather with a big smile and his commitment to CTF ! Also, for looking for ways to add value & going the extra mile! Taking on many responsibilities outside of your job description (Dust mitigation etc) with a smile and bringing a thorough & quality approach. For looking for ways to add value & going the extra mile to help make stakeholders work lives easier! You might have heard of a Net Zero home in the news or read about it in a magazine. So, what is it? A Net Zero home means that a house produces as much energy as it consumes. Energy consumption within a building is rated using the HERS index (Home Energy Rating System.) Reaching a 0 rating means the home is completely self-sustaining. A typical house has a HERS rating of 100-130. Footprint: Utilizing a modest building footprint and not over-building for your needs may be a first good step. The larger and more spread out a building is, the more energy it will consume. Climate Responsiveness: Employ passive design techniques such as south-facing windows that promote natural heating and daylighting. Also, limiting east/west exposure in hot climates helps to reduce cooling loads. Quality Construction: Incorporating good building practices such as correct flashing, sealing, framing, effective insulation, etc. to achieve a super-tight envelope is important. Quality of the construction should be integral to the design and really helps to minimize envelope loads. Systems Sizing: Integrating and sizing systems efficiently including heating, cooling, ventilation and dehumidification can really help to optimize the building’s performance. Renewable Energy: Homes need to utilize on-site renewable/alternative energy to generate power and heat. Solar panels, fuel cells, micro-turbines, etc. can be used to make and store energy to meet critical energy loads. These are just a few of the more important avenues to reach a home that is completely self-sufficient and considered Net Zero. By studying these important concepts we can produce a house that is much less energy reliant and contains a much smaller carbon footprint. Canadian Timberframes offers decades of experience working with clients throughout the United States and would love to meet up with you between September 30, 2016- October 2, 2016 booth # 137! 1. In January 2016, an already strong U.S. dollar hit an 11-year high against other major currencies. Did you know that with the lift in your US Greenback – as an example: you could possibly get your wall systems for free! The lift in your dollar could possible pay for our pre-manufactured wall systems for your whole house! Now that’s the type of SAVINGS you will see if you buy with Canadian Timberframes now! 2. We have built a solid reputation as one of the world’s premiere timber frame companies not only because of our quality, precision, and passion but because we truly care about our client’s needs. 3. Bottom line: CTF wall & roof systems + additional components offer exceptional value during the installation process and provides an efficient & cost effective solution. Offering cost savings to home owners & time savings to builders in various ways. 4. You do not pay duty on shipping across the boarder – we are sending our complete packages all across the United States. If you are looking to build that glamourous getaway; a new cottage deck; a timber addition; an expansion to an existing building; or a complete new customized home for your family, we can assist you with your 2016, 2017 or even 2018 goals. Contact us or Drop us a line @ sales@canadiantimberframes.com or call 1.877.348.9924 or better yet, come drop by our booth # 137 and let us know where we can help you out. PS. We would be happy to provide a complimentary ticket for you to attend the show, please let us know if you are interested @ sales@canadiantimberframes.com. Canadian Timberframes is proud to be one of the primary sponsors of the Schacher Trail in Golden BC. This single track trail will take 3 years to fully complete. And phase 2 (a total of 4.5 km of trail) was completed in time for the Singletrack 6 trans Canada Rockies Stage Race today. We had a ribbon cutting ceremony to 'officially' open the trail as the competitors of this world class event rode the new trail. There will be one additional phase adding 8 more km of trial, taking the trail to the top of Mount 7 where a Gazebo will proudly sit as a memorial to Sean Schacher, whom the trail was named after. This trail will provide single track bike access to the top of Mount 7, where previously the only option was an old logging road. So now enthusiasts can ride up to the monumental down hill ride of Mount 7. This trail is hugely significant for our company since Sean Schacher was a long term employee of ours….this project is really important to our company & all of our employees who have worked with Sean for years (and his Father Rick, who still works for us). It means a lot to everyone, the constant pride within our organization around the building of the trail & his tribute. “ We at Canadian Timberframes are very proud to sponsor this project, not only because what it offers our community & visitors but for the Legacy of Sean Schacher. Sean was a valued employee of ours and we think this trail is a very fitting tribute to Sean & his family." Says Stephanie Bowes, Executive Director at Canadian Timberframes. We at Canadian Timberframes & all of our employees are thrilled to see the continuous effort on this trail for Sean & the amazing access it opens up to mountain biking community! We all know that having an airtight house cuts down on our heating and cooling costs. But how tight do they need to be? Is it really necessary to have an extremely high performance house or should we be somewhere in the middle? Well, in the next few blogs I will be discussing insulation as well as air tightness and several methods that can be used to achieve the specific goal you want to strive for. The building envelope must consist of highly insulated exterior walls, roof and floor. This keeps the desired warmth in the house or undesirable heat out. Highly efficient triple pane windows are a must. They also need to be low-e glazing, argon-filled and have airtight frames. With these windows on the coldest day of the year, you can touch the glass and it will not feel cold! This means no part of the structure can act as a roadway for heating energy that can travel and escape right through your walls. With the Passive House standard, air infiltration can be no greater than 0.6 air changes per hour, at 50 pascals. That is a super airtight house! Orient your home so that the sun helps to heat it. Sun exposure can really help to keep your energy costs down. With a super tight house, clean fresh air is a must. By using an Energy Recovery Ventilator your house will experience 7 complete air exchanges in 24 hours. So, you might be thinking that this is pretty extreme. You also might be wondering how expensive this is. Initially the costs may be higher, but over time your energy costs would skydive. This is just an overview of the Passive House method, but it demonstrates some things that we could do within our houses to help save energy and therefore become less energy dependent. Did you know it was possible to incorporate your senses into your new home? I will discuss our five senses and the strategies you might use to integrate these into your new space. Sight is an obvious one and definitely the most used sense relating to architecture. To view a space is to see not only the solid forms but also the openness and space of an area. Using both light and structure in combination can make its occupants feel comfortable. The merger of these components can also take your home from just ordinary to something special and a place you want to hang out in! Acoustics of a building, though not initially obvious to us, can return a space’s movements and create an atmosphere that we can connect with. Increasing sound can boost the intensity of a space just like a sound track from a movie. To adjust the impact of sound, we can use sound absorbers or sound optimizers. Also, the forms of the building can affect sound. The ceiling height or shape of the room can affect the acoustics. With a high ceiling, sound has further to travel than with a shortened height. Also, different shapes of surfaces can bounce sound in specific directions to create an interesting effect. The sense of touch within a building can create a feeling of either relating or dislike. The touch of building materials itself can create this feeling but it‘s also possible to feel a space without touching its components. You can feel if a space is dim or bright just by being in it. The easiest example is the feeling of sunlight on your skin as you inhabit the space. Smell is our sense that is most closely connected to our memories. The smell of different materials or fragrances we use within a space can be recorded in our memory for a later time. Connections to these distinct smells can be recalled later and can stimulate various emotions that we might have had while being in the space. Taste is probably the toughest sense to link to in architecture. It has been proven though that architecture can stimulate taste through vision. It is possible that by mixing certain colors within objects of a building, it elicits some oral sensations. In conclusion, our senses are how we experience the world in which we live. Within a building we can use our senses to create special environments that are both memorable and a joy to be in. This warm & comfortable cottage designed by Walter R. Powell, Architect, at Sunshine Coast Home Design is a spectacular representation of recreational living. The interior palette of bright ‘sea glass’ colours brings the ocean setting inside and lights up the interior space. Enjoy perusing through the images, let the design & location inspire you. If this design speaks to you, we encourage you to jump on Sunshine Coast Home Design’s website to go through their entire gallery of homes. Or you can follow Walter Powell on Houzz @ houzz.com/pro/walterpowell/__public or on twitter @ twitter.com/walterrpowell. We would also like to thank Linda Sabiston of First Impression Photography for the use of the incredible images. Thanks Doris for picking up the slack & taking on the extra work load the past Quarter! Your efforts & dedication are greatly appreciated!! This is probably the most important factor in deciding how your home will react to its natural surroundings and thus daylighting conditions. I have included several discussions about this in some of my previous blogs, so feel free to refer to my articles that address designing for specific climates. I will point out though that the most important thing to remember is orienting your building to collect sunlight when needed at specific times of the year and then reflecting the sun during the other seasons. When thinking about daylighting, this is probably the first thing that comes to your mind. Windows have two essential functions in a building: daylight admittance and view allowance to its occupants. The size and location of windows are key to both of these functions. As a general rule, the higher the window head height, the deeper into the space the daylight can travel. However, the window still needs to be low enough for its occupants to see out. Another thing to consider is that too much sunlight can make the interior space uncomfortable, so there’s definitely a balance here and it depends on orientation, climate, window size and location. Skylights can be incorporated into a home to admit daylight in from above. Skylights can be either passive or active. Most skylights are passive which allows sunlight to penetrate a diffusing material through an opening in the roof. By contrast, an active system utilizes mirrors to capture the sun and channels the sunlight down into the skylight well to increase the performance of the skylight. This is another type of toplighting device. They use a highly reflective film on an interior surface of a tube to channel light from a lens on the roof to a lens at the ceiling plane. These tubes tend to be much smaller than skylights, but still deliver sufficient daylighting benefits. These devices take incoming direct sunlight and redirect it, usually into the ceiling of a space. They serve two functions, glare control and daylight penetration further into the space. They usually take on one of two forms: a large horizontal element (a light shelf) or a louvered system. By designing a building in specific ways, you are able to direct sunlight. For example, sloping an interior ceiling brings more light into a space. Also, designing a relatively narrow home allows more sunlight to enter the space. There are many other techniques, but these are just a few to consider. So, when you are working on the design of your new home, be sure to consider its daylighting needs from the very beginning. The sooner you identify and incorporate what specific orientations and techniques you desire, the better home you will have in the end. We are proud to be in our second decade of being the premier supplier of custom timber frame structures and packages throughout Alberta. 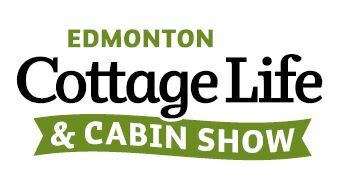 Whether you are still looking for a lot, need a designer, need a builder, are a builder or already have a set of plans in hand, come drop by our booth #119 at the Edmonton Cottage Life & Cabin Show and talk to one of our experts. Drop by our booth # 119 and speak to one of our experts. Check out some of the timber frame cottages, homes, or chalets we have manufactured. We invite you to contact us and give us the opportunity to personally discuss your dream home, cottage. Whether you are still looking for a lot, need a designer, need a builder, are a builder or already have a set of plans in hand, come drop by our booth the Spring Cottage Life Show. Did you know that as humans we crave a connection to our natural world? Having contact with nature in our everyday lives provides numerous health benefits and makes us happier people! Designing buildings to connect with nature can be accomplished in many ways. Making nature visible within a building elevates the spirit. It gives us a visual connection with the outdoors and our natural environment. It can reduce stress, produce more positive emotional functioning and actually improve our concentration. Views can be accomplished with glazing placed at strategic locations throughout the building. Having large expanses of glass means the outdoors can flow seamlessly into the indoors. Windows with views to natural places help to achieve this important connection to nature. Daylighting also introduces a part of nature into a building. Sunlight can improve our mood and bring a more natural and comfortable feel to the interior of a building. It also reduces our reliance on artificial lighting and thus less energy use. Fresh air is an important aspect of introducing nature into architecture as well. It can stimulate our olfactory senses and provide pleasant breezes that just make us feel in tune with our natural environment. It can also contribute to the cooling of our spaces without the use of artificial cooling systems. Did you know that hearing or viewing aspects of nature such as water can also improve our mood and overall health? Whether it means including a water feature within our building design or providing openings to listen to or view natural water features outside, water can have a positive impact on our everyday lives. The materials that make up our building can also improve our connection to nature. Construction materials such as wood and stone can create a more natural-feeling living environment that establishes a more comfortable setting. Colors of interior spaces can also have an impact on our mood and overall mental health. Having indoor plants within our architecture can produce positive effects as well. The plants purify, humidify and oxygenate the air within a space, thus improving indoor air quality greatly. They also visually help to connect an occupant to his/her natural environment when direct views of the outdoors are not possible. In summary, a connection to nature within our built environment is crucial to our overall well-being. By utilizing just a few of these methods to connect us to our natural environment, we become healthier, happier and more productive people! We are thrilled to welcome David to our team & are excited about his extensive knowledge of the Quebec Market where he lived for most of his life, up until the last 7 years. David, obviously bilingual, lets us expand into a market where we could not previously service appropriately because of the language barrier but, can now approach with confidence. David will focus on the Laurentians, Eastern Townships, Outaouais, Lanaudière, Charlevoix to name a few but happy to help anyone out who is interested in more information about timber frame construction & design. David brings with him a long history in the building construction industry with over 10 years of combined stick frame, timber & log building experience. He also has extensive background in the ski industry with over 7 years of soft & hard good sales and, was with the Canadian Snowboard Cross Team for 4 years leading up to the Sochi Olympics. David is thrilled to be working with Canadian Timberframes where he can put many of his passions to work. He loves to get to know clients stories, what drives their dreams and loves helping shape them into a new reality; a custom timber frame home, chalet or cottage. Please join us in welcoming David to the team. Drop by our Booth # 2103 and speak to one of our experts. We would love to chat with you about your dream home. Or Contact us today to talk about your timber frame project. Come drop by our Booth # 221 and speak to one of our Experts. We would love to chat about your dream project! Or please contact us today about your up coming project. It has been years since there has been such a benefit with the exchange rate. In January 2016, an already strong U.S. dollar hit an 11-year high against other major currencies. There is no better time to consider Canadian Timberframes and enjoy a lift to your US $’s! You will see significant savings & get to choose to: either just save your dollars; or upgrade some of the finishes you dreamed of having! Q &A: We are often asked if there are import duties on any of our products purchased by US customers. We are happy to report that there are NO import duties levied on pre-manufactured timber frames and package materials. Contact Us to learn more. We invite you to contact us and give us the opportunity to personally discuss your dream home, cabin or chalet. We are proud to be in our second decade of being the premier supplier of custom timber frame structures and packages throughout Vancouver. Whether you are still looking for a lot, need a designer, need a builder, are a builder or already have a set of plans in hand, come drop by our booth # 1235 and talk to one of our experts. Check out some of the timber frame cottages and homes we have manufactured in BC & on the Island. We invite you to contact us and give us the opportunity to personally discuss your dream home. We are proud to be in our second decade of being the premier supplier of custom timber frame structures and packages throughout Montreal. Whether you are still looking for a lot, need a designer, need a builder, are a builder or already have a set of plans in hand, come drop by our booth # 1083 to one of our experts. 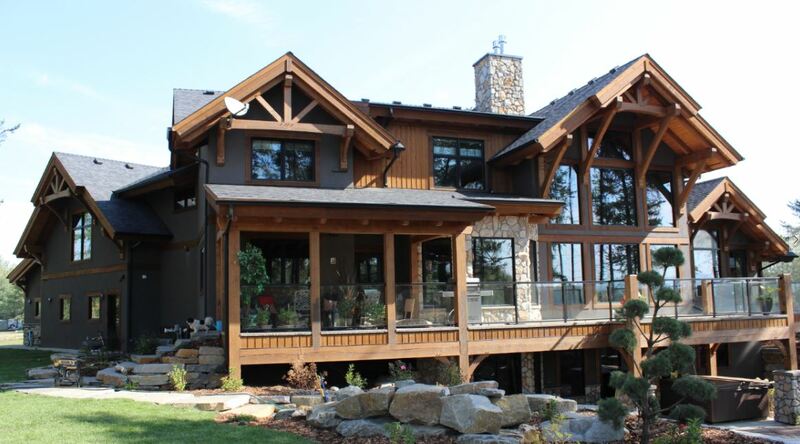 Canadian Timberframes has built a reputation as the premier design, manufacturer and installer in the timber frame industry by supplying quality product to clients, builders and architects, resulting in over 1000 projects across North America. Drop by our booth # 1083, and talk to one of our experts. We invite you to contact us and give us the opportunity to personally discuss your dream home or chalet. This is my final blog covering the four broad climate types we find in North America. To close the conversation, I would like to discuss Alpine zones. Homes in alpine environments have the highest thermal comfort energy use of any climate zone. The general objectives for buildings in the alpine zone is to reduce heat loss, provide protection against cold winds and provide alternate heating sources. Because the need for cooling is low, design strategies can mainly focus on heating energy use. -Sunlight is key. Try not building on sites without good access to sunlight. It’s difficult to harness the solar radiation from the sun without compromising the insulation effects of the building form. In the Alpine climate, it’s definitely a balancing act. This concludes my series on design for specific climates. I hope that this has made you aware of various design principles that you can utilize within the design of your new home to better fit your specific environment. In this blog I would like to discuss Temperate climates and what specific design characteristics we can employ to react to the distinct conditions of this zone. A temperate climate typically includes a hot and dry season followed by a wet and warm season and then winter conditions. This makes it a challenging climate to design in. The goal is to keep a balance between conflicting requirements. In the winter, you need to seek solar radiation gain and then provide shading in the summer. Designing in temperate zones is challenging, but by utilizing a few of these design techniques, it will greatly improve the comfort within your home and overall energy demand. Canadian Timberframes would like to welcome Chris Koehn to the team. We are excited to have him join our sales team in the capacity of Pacific North West Regional Sales Manager. Chris brings a wealth of knowledge and experience within the custom home industry to his regional market. We are thrilled to have this caliber of talent join our team. “Chris was bitten by the timber framing bug while doing undergraduate work in Europe. “There’s something about spending time in and among ancient timber frame structures- homes, churches, and barns that were built by craftsmen hundreds of years ago- that struck a deep cord in me.” After completing his degree, Chris took an opportunity to pursue timber framing as a career and hasn’t looked back. “Since the 1980’s I’ve been a timber framer, foreman, sales person, designer, instructor, and general contractor. The consistent theme has always been timber framing. It’s my passion." Chris can be reached at ckoehn@canadiantimberframes.com or through him mobile at (250) 732-6991. Please join us in welcoming Chris! I discussed the hot arid climate in my last blog and how we can accomplish a more comfortable living environment within our homes by following a few design guidelines. Next, I want to talk about Warm Humid Climates and what we can do to address this specific zone. The main objective with a warm humid climate is to reduce the impact of sun and to provide cooling with wind as much as possible. -Orient house on north/south axis to provide maximum ventilation and free air movement. These are some important ideas to consider as you begin the process of designing your new home in a warm humid climate. Shade and ventilation are really the key and by thinking about this in the beginning you will have a superior finished product in the end. Thanks Judy for taking personal pride & ensuring top notch quality control on the application & consistency of our staining & Finishing. Plus contributing to our company culture by suppling treats to her fellow co-workers (mostly out her own pocket)! It has been years since there has been such a benefit with the exchange rate. There is no better time to consider Canadian Timberframes for your up coming projects and enjoy a lift to your US $’s! Q: We are often asked if there are import duties on any of our products purchased by US customers. A: We are happy to report that there are NO import duties levied on pre-manufactured timber frames and package materials. Contact Us to learn more. What an amazing Parade of Homes in Summit County, Colorado this past weekend. After 2 days of beautiful weather and inspiration the "Unofficial Canadian Judge" Jeff Bowes, gives first and second place to Allen Guerra Architects for their two projects in Breckenridge. In my last blog I discussed how the various climates that we find in North America can influence design and how the four broad climate types we find calls for varying design techniques. The first climate that I want to discuss is the Hot Arid Climate. The main idea in a hot arid zone is to reduce uncomfortable conditions created by the extremes of heat and dryness. Houses must remain cool in the hot summers and warm in the cold winters. During the summer, sun is the enemy. It is important to provide maximum shading of direct solar radiation during the day and flush out any stored heat during the cooler nights. By utilizing these design considerations, a more comfortable living environment can be achieved with less mechanical means and thus much less energy use. And ultimately you will arrive at a much preferred and more comfortable home. Wood shopping for amazingly large logs that will be crafted into enormous feature timbers! This impressive log will at some point be crafted into enormous timbers. We specialize in custom builds and our machinery can impressively handle much larger pieces of log & timber than many other outfits can handle. Stay tuned for the operational challenge of unloading this impressive piece of wood that one day will make one of our clients extremly happy that they will have a feature in their home that many could only dream of. Settling into their new timber frame and enjoying the home that they had dreamed of having! Spend some time on a 'virtual' tour through this Bowling Green, Kentucky home. We have loaded great photo's of their lot, exterior & interior living spaces. Browse through the whole building process: from design, through construction and now the finished home! This home is a great example of the many products that Canadian Timberframes has to offer. You will be able to see many of our products throughout the finished pictures. Canadian Timberframes would like to welcome J'Anne Claridge Monteleone to the team. We are excited to have her join our sales team in the capacity of Alberta Regional Sales Manager. J'Anne brings a wealth of knowledge and experience within the custom home industry to her regional market. We are thrilled to have this caliber of talent join our team. In her 30 year career in the home building industry, J’Anne has helped hundreds of clients design and build their custom homes right across Canada and the United States. She loves the synergy of the design process and her extensive design and construction experience helps her clients get exactly what they want ensuring a smooth process from start to finish. J’Anne has a real talent in helping people envision their home and incorporating their needs and wants into a functional and beautiful design. She is equally comfortable working with people face to face or long distance and treasures the lifelong friendships that come from working so closely with her clients. Born and raised in British Columbia, she has always had a particular passion for timber frame homes and loves the soaring vaulted ceilings and large fir bents. Her dream is to build a timber frame home on a piece of property that has views of mountains, water and horses running in a field. J’Anne and her husband Barry have five children and seven grandchildren between them and love spending time with them. They have a passion for travel and prefer to stay with the locals rather than in hotels and spend time exploring the lesser known spots away from the tourists. They enjoy hiking and like to search out and photograph beautiful vistas along the way. They have not yet mastered the art of the couple’s selfie, and have lots of awkward pictures of themselves to show for their efforts. They have never met a Farmer’s Market that they didn’t love and go out of their way to buy local produce wherever they are. They enjoy cooking gourmet meals together as well as tending to their extensive flower gardens. Barry is attempting to teach J’Anne to golf which is an entertaining spectator sport in itself! “There is tremendous satisfaction in seeing a home built from concept to reality. Walking into a home that I’ve helped designed and only “seen” on the computer screen is a thrill that never wanes.” Says J'Anne. J'Anne can be reached at jmonteleone@canadiantimberframes.com or through her mobile at 403.616.9686. Please join us in welcoming J'Anne! Did you know that each specific climate warrants different design details than others? A home located in the Arizona desert calls for contrasting design characteristics from one located in the Rocky Mountains or one that is sited on the ocean’s coast. Below is a short list of distinctive design characteristics for each broad climate type that we typically find in North America. In hot arid zones, the main objective is to reduce uncomfortable conditions created by the extremes of heat and dryness. Usually in this climate there are great variations between day and night conditions. It is important to provide maximum shading of direct solar radiation during the day. Usually these conditions can be controlled easier with compact designs that incorporate shade and controllable ventilation. This climate is characterized by high rainfall and high humidity. The temperature differences are minimal and winds are typically light. The most important design considerations involve providing maximum ventilation by designing large openings. Also, providing maximum shading of direct solar radiation is important. Generous shading devices can assist with this. Vegetation can also be used to provide shade. A temperate climate typically includes a hot and dry season followed by a wet and warm season and then winter conditions. This makes it a challenging climate to design in. The goal is to keep a balance between conflicting requirements. In the winter, you need to seek solar radiation gain and then provide shading in the summer. Also, you need to provide wind protection in the winter and proper ventilation in the summer. Some of these requirements can be satisfied by providing semi-compact forms and an orientation to benefit from the winter sun. The alpine climate is characterized by low humidity and high temperature ranges. There typically are cold winters, warm summers and highly variable spring and autumn conditions. Good access to sunlight is important, therefore maximizing southern exposure is key. Stretching a building out in the east/west direction helps with both sun exposure and essential ventilation which is imperative in the summer months. This is just a preview of a few of the design challenges that you may encounter with these specific climate types. For my next few blogs, I will focus on each climate separately and discuss specifically what we can do to design buildings smarter and more environmentally friendly for the setting we each live in. Stay tuned…. Jeff Bowes, President & Partner at Canadian Timberframes was on site with the owners of this outstanding timber frame home while it was getting shot for an upcoming feature in a timber magazine. This home is designed by Kelly & Stone Architects. They are dedicated to providing innovative yet sensible architectural design solutions. This client fell in love with K&S designs and is pleased to have them work on their retirement home. The contemporary feel to the traditional rustic mountain charm uses mono trusses to give this home a more modern up-to-date feel. The trusses used this way create a unique style to the home. The slopes juxtaposed against the rolling smooth greens of the golf course, help make this home stand out in it's setting. Stay tunned for updates to this project when our new photo's come in and the editorial story is released. How do you begin describing to your architect what kind of floor plan you might want in your new home? Is there a certain type of layout that might fit your lifestyle better? Is there a way to organize the spaces within your home to suit your specific family? Well, let me begin by explaining a couple of common floor plan concepts that many homes incorporate within their overall design. Open Floor Plan: This is the most common type of floor plan over the last ten years or so. An open floor plan caters to a more relaxed, but busy lifestyle. Homeowners tend to entertain less formally and want to spend quality time with their family whenever possible since their life is more hectic. An open floor plan provides a space that is both welcoming and relaxing and allows everyone to gather in the same larger space together. With an open floor plan, there is typically a “great room.” In this “great room” is contained a kitchen, a living space and an eating area. These spaces are typically open to one another but may be delineated slightly with ceiling changes or furniture arrangements. Sometimes a formal dining room is eliminated entirely and a dining nook serves as the family eating area. The idea with an open floor plan is that everyone feels a part of the conversation even if one person is cooking in the kitchen, one is doing homework in the dining nook and another is watching TV in the living area. Typically within an open floor plan, there are auxiliary spaces like a pantry or utility room, mud room, home office, etc. that are usually sited to be adjacent to the great room space. Also, the master bedroom is often located on the main floor level. Additional bedrooms may be located on the main floor level as well or may be separately upstairs or downstairs, depending on the configuration of the site. Outdoor spaces are also typically located adjacent to this larger great room space and may contain an area for grilling, an outdoor sitting space or dining area as well. Closed Floor Plan: In contrast, a closed floor plan is one that was more common in older homes. This concept separates spaces from one another with walls and/or doors. There is usually a separate room for the kitchen as well as a formal dining room. The advantages to this plan are that it is easier to handle noise and smell. By keeping areas separate and being able to close doors, unwanted noises and smells can be isolated. Also, in closed floor plans you can more easily hide messes when guests come over. The full sink in your kitchen can be shut off from the rest of the house. In addition, closed floor plans offer more privacy to their occupants. There are definitely advantages to both floor plan concepts. You just need to ask yourself which layout suits your lifestyle better. And maybe, it’s even a combination of the two. There are endless options to a floor plan layout, so the decision is yours! Check out our collaboration with Blue Sky Architecture. Congratulations Joachim! The award was well deserved! Ever wonder what the difference is between an eave and a gable end roof of a house? We have had various discussions about roofs in my latest blogs. But, I haven’t yet discussed the difference between an eave and a gable end roof of a house. What is the meaning of each of these and how do they differ? Well, let’s first talk about the definition of each. Function: Now that we understand where both the eave and gable overhangs occur on a building, why do we need them? Well, they are important features of a building and actually serve a purpose. The primary function of eaves is to keep rain water (or melting snow) off the side of a house. It prevents water from entering the house at the point the roof meets the wall. Gable (or Rake) overhangs pretty much provide the same sort of protection, but at the end wall of a house. Some other purposes for eaves might be to prevent erosion of the foundation footings below the house by carrying the water away from the edge of the building. They also help to reduce splatter from water as it hits the ground below. In some home designs deep roof eaves and gables may serve to protect the home from solar gain. They may also be designed to allow important sun angles in to heat the house in the winter and then keep the hot sun out in the summer. History: In history, eaves haven’t been just about protecting a building. They have also been a place of decoration and ornamentation to define specific architectural styles. For example, a craftsman style home can be categorized by its large eaves and gables that contain decorative brackets. Also, back in the days of Roman and Greek architecture, the buildings contained cornices finished with decorative molding which served the purpose of eaves. In addition, in Chinese architecture they utilized dougong bracket systems which are unique structural elements of interlocking wooden brackets. Parts: Eaves may terminate in a fascia which is a board running the length of an eave to protect the ends of the roof rafters. The underside of the eaves may contain a horizontal soffit fixed at a right angle to the wall to seal the gap between the rafters from weather. I hope that this discussion involving eaves and gables (or rakes) gives you a better understanding of their differences and why we need them. Can you imagine how ridiculous your house might look without them? With partners Kelly and Stone Architects, Olde Stone is now complete. Enjoy the exterior photo's of this architectural timber frame beauty. You are working with your architect on designing your new home and he or she starts talking to you about roof pitches. Do you want a 4:12 roof or an 8:12 roof? How about a 9:12 roof instead of a 10:12? What is a roof pitch? I’m so confused! Well, the pitch of your roof is the angle at which the surfaces slope. The roof pitch is written in a ratio of inches. It is the number of inches of rise for every 12 inches of horizontal distance. For example, a roof with a 4:12 pitch rises 4 inches for every 12 inches of horizontal roof run. To visualize this, picture the roof pitch as a right triangle. The angled side is the roof, the vertical leg is the rise and the horizontal leg is the flat roof run. Are there certain pitch standards to abide by when designing your roof? Not really. Many builders consider a low-pitched roof to be anywhere from a 2:12 to a 4:12 slope. Then, a 4:12 to a 9:12 is typically a medium pitch range and anything from a 9:12 and above is considered a steep-pitched roof. The most common residential roof slopes range from a 4:12 to a 9:12. Typically, the steeper your roof pitch, the more expensive it is to have installed. Builders usually need special equipment to build steep-pitched roofs and there is also additional risks for workers. However, a steeper roof removes water, ice and snow more quickly than its shallow counterparts and usually means a longer lasting life for your roof. It’s really up to you and your architect and what looks good for your particular design. The options are endless! Flat: Flat roofs are just that, flat. They are typically used where the climate is arid and drainage is of secondary importance. They are a very popular roof type for warehouses, commercial spaces, office buildings and often residential structures. Shed: This is the first category of many sloped roof types that I will be discussing. The shed, sometimes referred to as “lean to” or “mono-pitched” contains only one pitch. You can think of it as a flat roof that has been tilted slightly. It is often used on just a portion of a home. The shed roof is usually used in combination with other roof forms to create a home with interesting rooflines. Gable: A roof with two slopes that form an “A” or triangle is called a gable roof. This type of roof is very common on North American homes. The gable roof can contain roof pitches that are very shallow to ones that are extremely steep. Also, numerous gable roofs can be placed together at perpendicular angles to cover a home with many wings. Clerestory: A clerestory roof is one that combines both a gable and shed roof. A clerestory usually contains a higher gable roof that sits atop a short wall with a shed roof below. This allows for windows to be placed within the short wall for light within the interior of a large space. Hip: A roof that starts with a gable shape but has a sloped end instead of a vertical wall is called a hipped roof. The hipped roof slopes upward from all four sides of a structure, having no vertical ends. This type of roof is very common in residential designs. Gambrel: A gambrel roof is a type of gable roof with two slopes on each side, the upper being less steep than the lower. This roof form is very common in barn designs. Mansard: This type of roof is a hipped gambrel roof, thus having two slopes on every side. It can provide extra attic space or other rooms without having to build an entire additional floor. Pyramid: As the name suggests, this type of roof is shaped like a pyramid. This kind of roof is usually on a small portion of a house or on small structures such as a garage or pool house.